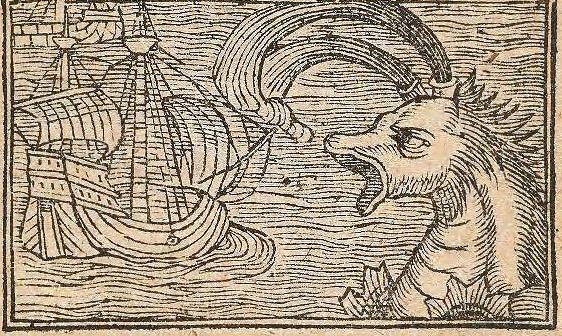 We will admit that Historia de gentibus septentrionalibus is also beloved by us here at the Smithsonian Libraries for the marvelous cavorting beasts and monsters that populate the work. The many mysteries of the Nordic countries, often marked “terra incognita” on maps, accounted for the book’s avid contemporary readership. 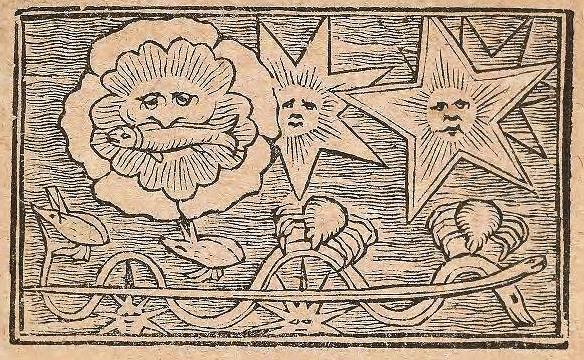 Reflecting its popularity, many editions in several languages followed its initial printing. Two of these publications reside in the Smithsonian: a Latin edition, published in Antwerp around 1557, is in the Joseph F. Cullman 3rd Library of Natural History collection; an Italian translation of 1565, in a larger format, is housed in the Dibner Library of the History of Science and Technology. The Cullman copy was a gift of Frederick M. Bayer, marine biologist and curator in the National Museum of Natural History who specialized in corals. 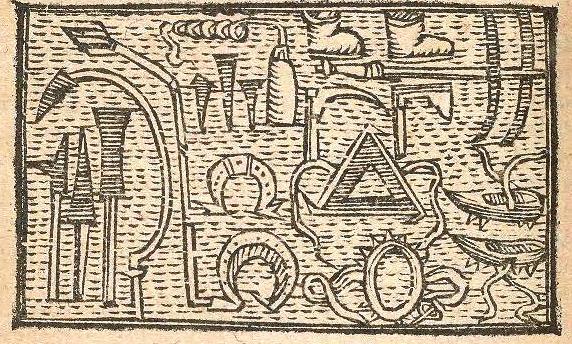 Olaus Magnus (1490-1557), caught in religious and political tumults, composed his Historia while in exile in Rome. Nominally the Archbishop of Uppsala, he was to end his days in the Eternal City, supported by a Papal pension. Often described as a patriotic work, there is an element of nostalgia for the author’s lost land, the realm of cold. Early in his career, as an assistant to the papal seller of indulgences, he traveled the far reaches of northern Sweden, Norway and Finland. 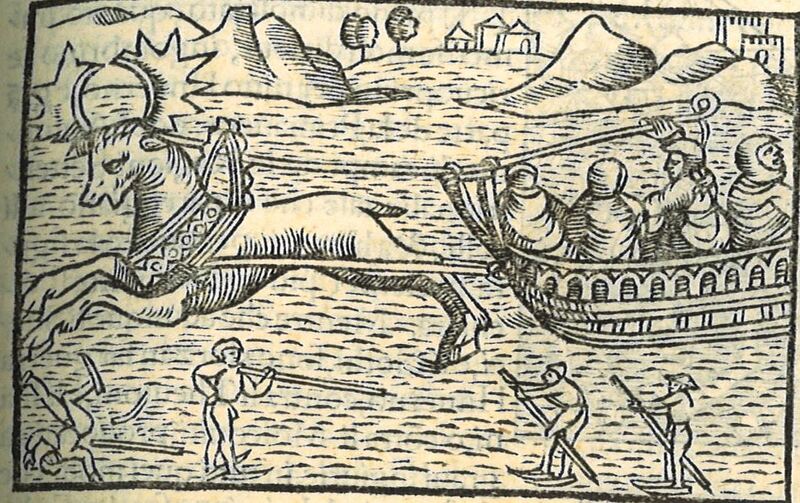 Following those wilderness journeys, Olaus Magnus was a vicar and then a cathedral dean in Sweden as well as a roving diplomat for Gustav I Vasa of Sweden before being called to Rome in 1523, never to return to his homeland. Following the Lutheran Reformation in Sweden, Olaus Magnus remained a Catholic in defiance of the King, spending years in Danzig, Poland with his brother, Archbishop Johannes Magnus, before settling in Rome. 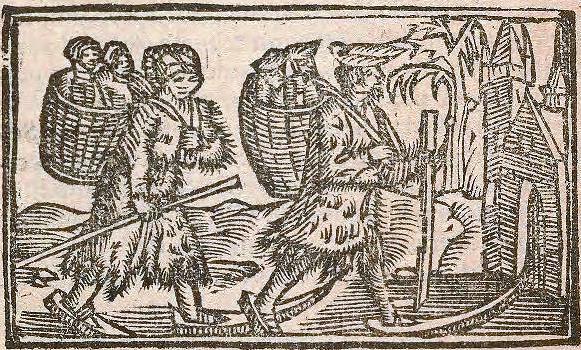 Drawing from Olaus Magnus’ memories, the book offers images of moonlight and endless nights, mighty reindeer, backcountry skiing, primitive skating, snowshoeing and sledding amidst great expanses of snow, especially enchanting this time of year. The encyclopedic work also records folklore of Christmas time. 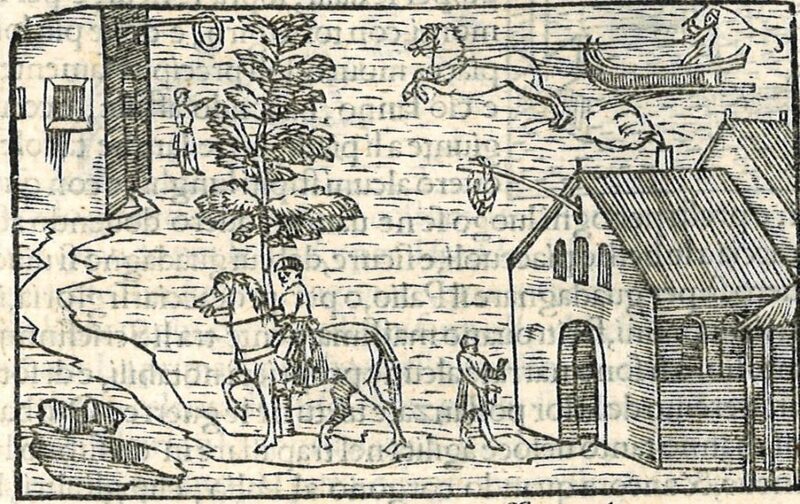 A legend from Prussia, Livonia and Lithuania is recounted where a “strange mutation of men into wolves” gathered on Christmas night. The werewolves drank heavily for twelve days until the Epiphany. During that period, the monsters marauded human settlements in remote woods and raided beer and mead cellars. Then, there was a gathering at a ruined castle to play werewolf games. Those too fat to compete by jumping over a wall were eaten. 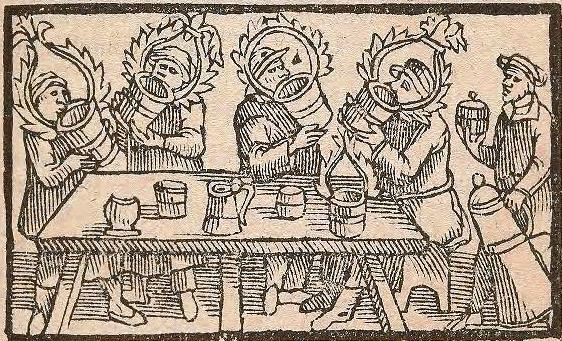 More pleasant Yuletide marvels from Olaus Magnus’ survey include the first written description of the preparation of the now traditional Swedish Christmas food of lutfisk, a dish of dried fish soaked in lye (for non-Nordic types, maybe also not so nice). An account is recorded here of the second-day Christmas ritual of horse racing on ice. Another Northern festivity also included the furious dance of warriors around fires made of pine trees. It is Olaus Magnus’ devotion to his heritage and the strength and courage of the peoples of the North in their deep, snowy wonderland that evokes the spirit of the season. Is there a more stunning place for Christmas than present-day Sweden? 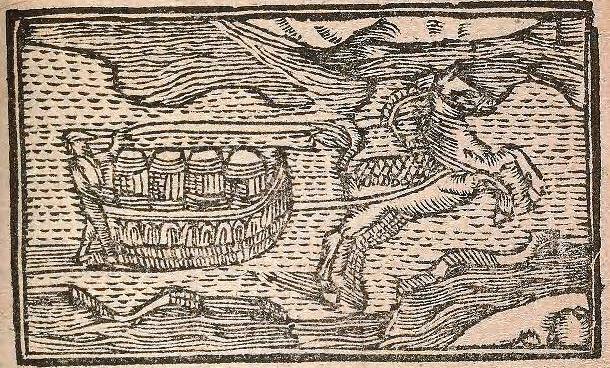 But it’s a bittersweet thought, imaging Olaus Magnus as the lonely refugee in the monastery of St. Brigitta in Rome, dreaming of the cold, dark, but beautiful and mysterious landscape under the snow that was once his home. 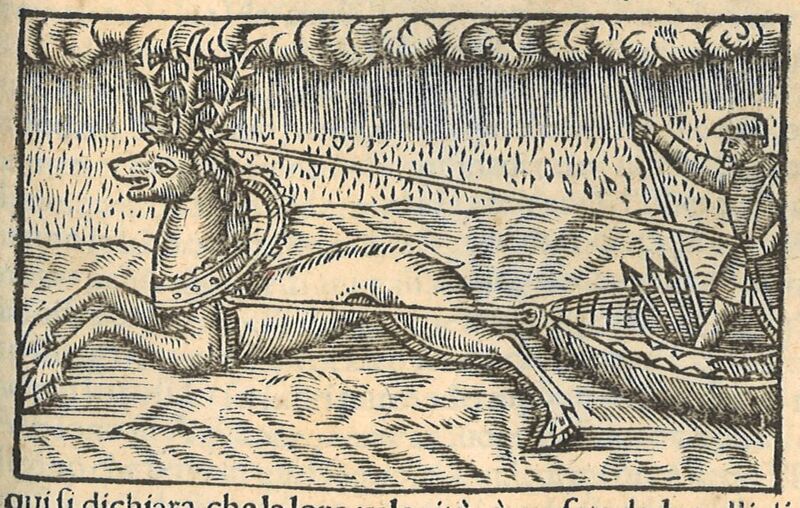 Olaus Magnus remarked upon the importance of reindeer in the North. He noted that the animal could be ridden upon, even in the deep snow of the mountains. In addition to pulling sleds (on the left, in a snowstorm), reindeer provided food and clothing and could be milked. 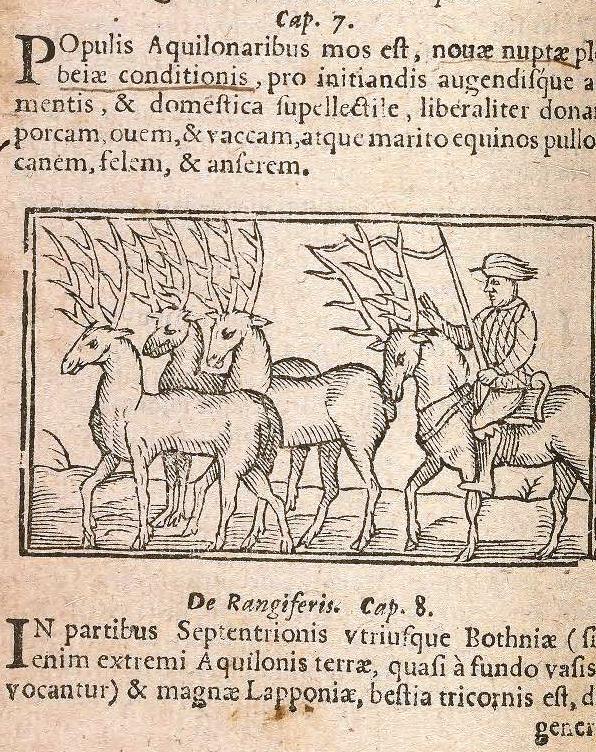 The author portrays his reindeer as crowned with three antlers. Above, ice is navigated by individuals on equipment that appears to be a combination of cross-country skis and paddle boards (one poor soul not doing too well). Other more fortunate travelers sail by in a fancy sleigh with a most interesting type of rudder on this winter boat. The travelers above are off to church: gliding in with the young ones in baskets (backpacks of the day) and in fur coats. The author observed that “The ‘sliding Finns’ (or Scric Finns) live between Bjarmia and Finnmark in Scricfinia” could easily traverse tough mountainous terrain. 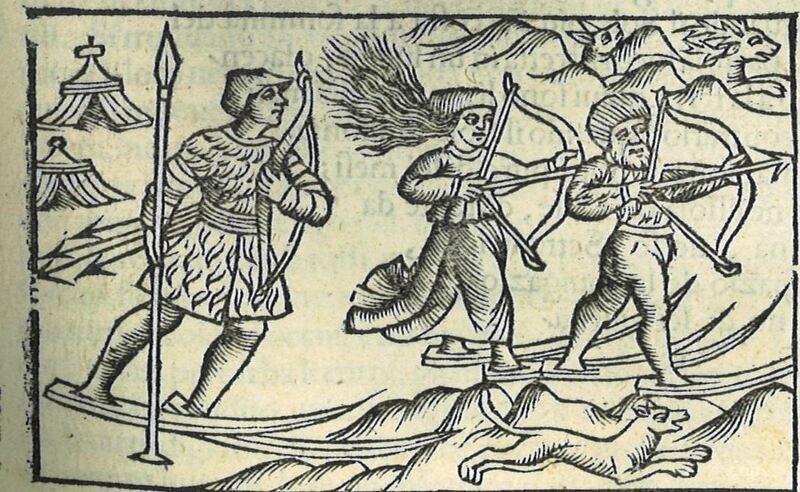 Note the huntress with the flowing, wild hair. 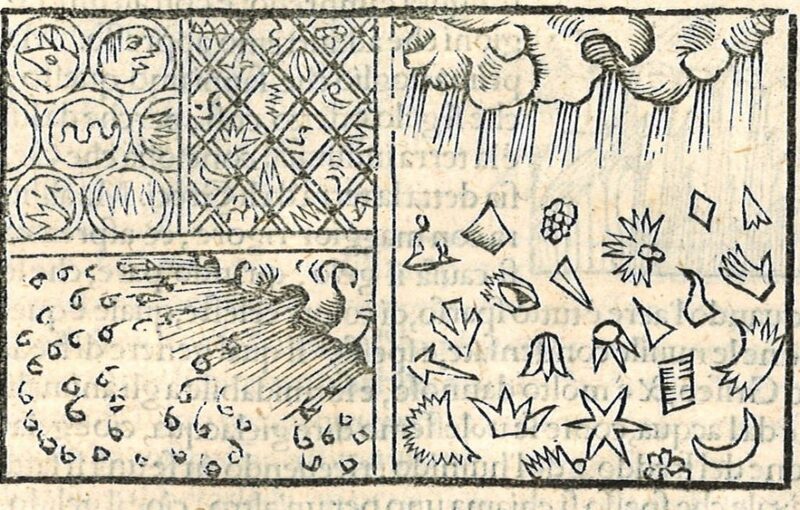 Olaus Magnus’ work is often cited as containing the first known depiction of snowflakes in Europe. Abandoning any scientific observational skills and ignoring the snowflake’s six-point symmetry except for one star, represented are an amazing selection of shapes, including what looks to be a speeding eye and a hand. In the upper left are window panes of a house iced over; below is a snow storm. Snowball fight! – Boys defending their Snow Castle from assault, although its walls are being breached by the opposing force tunneling in. 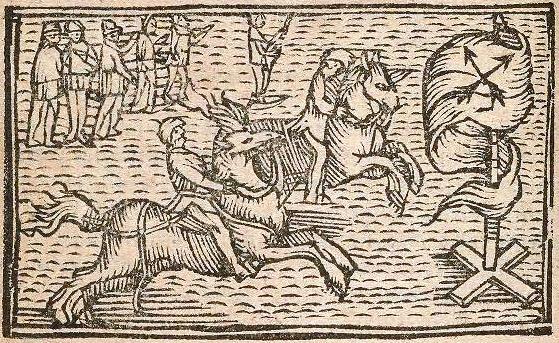 In this illustration, the post-Christmas Day horse race is shown. Galloping towards the goal of a flag with two crossed arrows, the horses appear to have crampons for the snow and ice on their hooves. 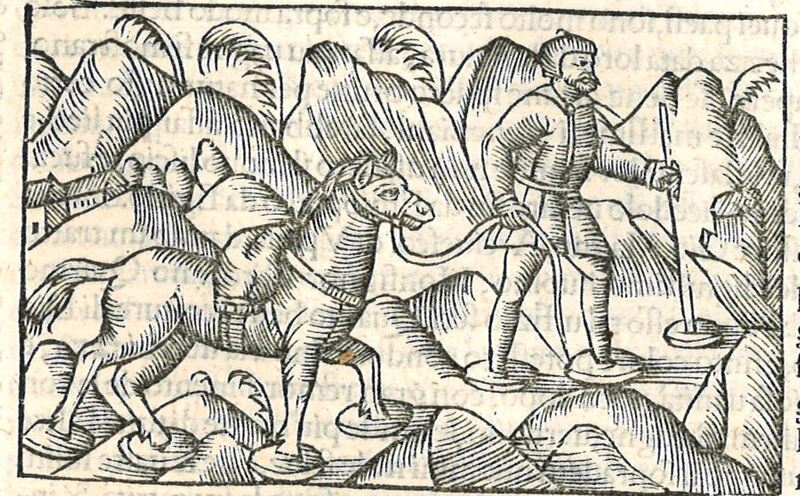 This woodcut is of a merchant with his trusty packhorse traversing the mountains between Norway and Sweden. They both wear circular snow shoes which even outfit his walking stick. The horse is affectionately portrayed. 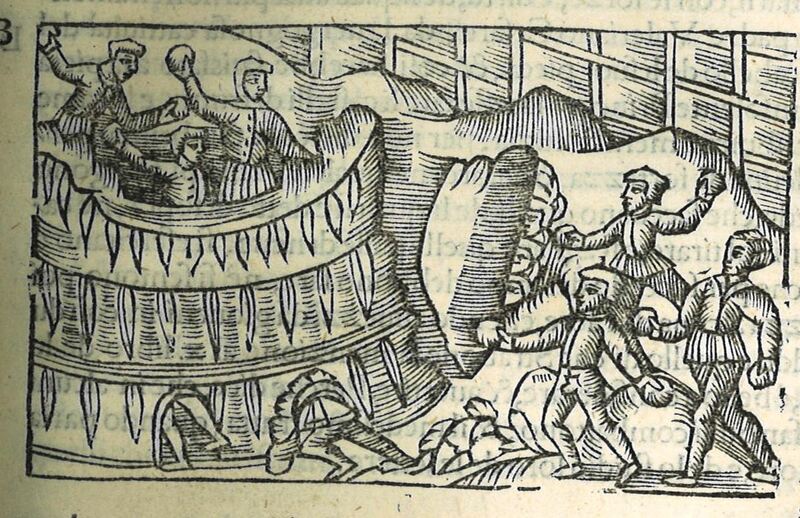 Ice hotels are not a new trend. This illustration depicts lodgings on the ice (indicated by hatch marks) for travelers. The inns are advertised by wreaths hanging from a pole. The ice field is also implied by the horse and sleigh as well as the hole (for ice fishing?) in the lower left corner. Implements for ice. Shown are ice axes, gear for ice fishing, horseshoes, and boots with crampons for traversing ice by beast and man. A sleigh full of barrels being hauled, improbably, over an ice floe. Bottoms up! The custom of veneration for higher beings, princes and noblemen is shown in this depiction of a drinking bout. Magnificent ale bowls, with horn-shaped branches, are hoisted in a toast. An enormous tankard is being brought to the table. Cheers! May all your winter days be merry and bright. Next Post Applications for 2017 Professional Development Internships now open!